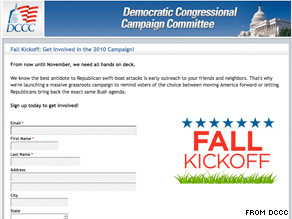 The DSCC is out Saturday with a new attack ad against Missouri Rep. Roy Blunt. (CNN) - The Democratic Senatorial campaign committee is out Saturday with a new attack ad that paints senior Missouri Rep. Roy Blunt as a symbol of Washington insider politics and condemns the Senate candidate for voting for the federal government's massive bailout of the financial industry in 2008. "A culture of corruption and special interests where Missouri gets left behind," the DSCC's ad says. "And, when our economy collapsed, Washington is where Roy Blunt took the lead and voted for the $700 billion Wall Street bailout." The bill passed largely due to the support of Democrats - 172 of them voted for the bailout package. 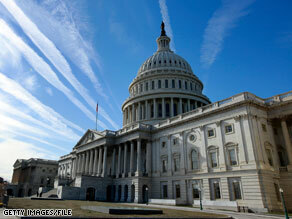 It passed the House in October 2008 with 263 votes and with members of both parties split on the issue. 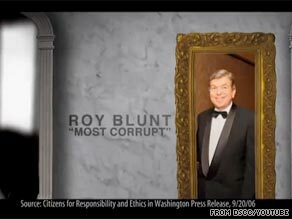 The 30-second television ad calls Blunt "one of Congress' most corrupt politicians," a reference to the unflattering designation bestowed upon him in 2005 and 2006 by the advocacy group Citizens for Responsibility and Ethics in Washington. 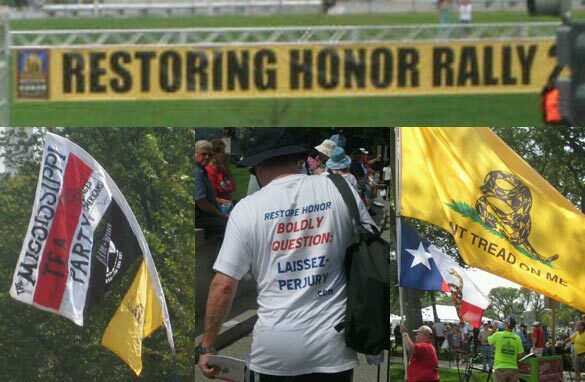 Washington (CNN) - In what resembled more a revival than a political rally, conservative talk show host Glenn Beck urged the large crowds at his "Restoring Honor" event Saturday to "turn back to God" and return America to the values on which it was founded. 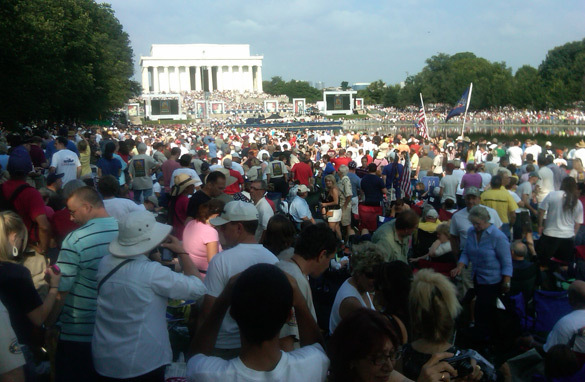 "Something beyond imagination is happening," he told participants who packed the National Mall in Washington. "America today begins to turn back to God. 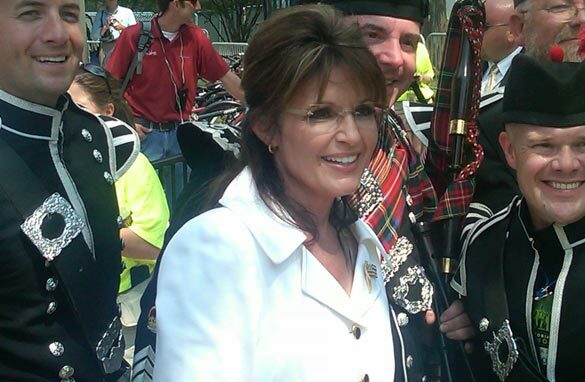 For too long, this country has wandered in darkness." The rally drew fire for its timing and location. 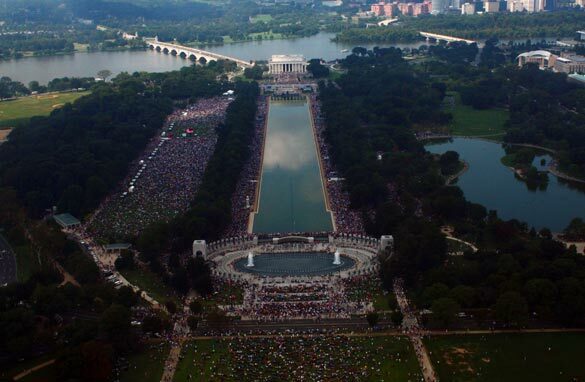 People filled the park by the Lincoln Memorial's reflecting pool, in the shadows and echoes of the most pivotal civil rights address in America's history - the Rev. Martin Luther King, Jr.'s famous "I Have a Dream" speech, which he delivered there 47 years ago. (CNN) - The Rev. 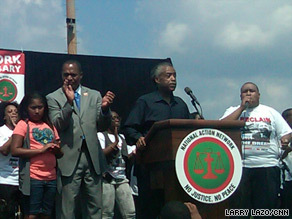 Al Sharpton, who is spearheading the "Reclaim the Dream" march and rally Saturday on the 47th anniversary of the Rev. Martin Luther King, Jr.'s "I Have a Dream" speech, indicated that conservative forces will face a fight in the upcoming elections. "We're coming out to fight and we're not going to let you turn back the clock," he said. A man holds a sign at the ‘Restoring the Dream’ rally in Washington on Saturday. (CNN) - Marc Morial, head of the National Urban League, told a civil rights rally on Saturday that "we will not stand silent as some seek to hijack, as some seek to distort and contort, as some seek to bamboozle and confuse the vision of Dr. King's dream." 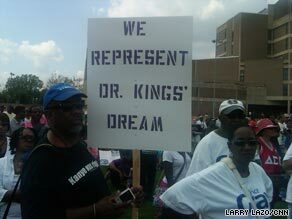 Morial was speaking at the "Reclaim the Dream" rally, marking the 47th anniversary of the Rev. Martin Luther King, Jr.'s famous "I Have a Dream" speech. He spoke in northwestern Washington as conservatives rallied at conservative talk show host Glenn Beck's "Restore Honor" event at the Lincoln Memorial, a few miles away. 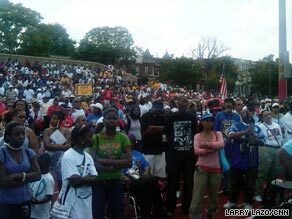 The crowd at Al Sharpton’s ‘Reclaim the Dream’ rally in Washington. (CNN) - NAACP President Benjamin Todd Jealous, speaking at the "Reclaim the Dream" rally Saturday, castigated the message of the Glenn Beck rally across town in Washington. "For a year and a half, we've been subjected to small hearts and small minds on our small screens," he said, referring to conservative ideas on media. Beck is a conservative talk show host, with a program on Fox News as well as several radio programs. Urging people to continue to fight for issues like health care and the ideas of the Rev. Martin Luther King, Jr., Jealous said, "It's time to make sure our country - when they turn on the TV - sees itself reflected back." (CNN) - Minnesota Rep. Tim Walz may have more momentum heading into the fall than other freshman and sophomore lawmakers, but in a volatile midterm election season, his bid for a third term is far from a sure thing.